Sometimes, the right idea just needs the right material to turn it from a simple thought into a seriously effective solution. For countless entrepreneurs, that material is Sorbothane®. Our team has worked with a number of individuals in giving life to their innovative ideas. Below are just a few examples of the creative, problem-solving people we've worked with and the solutions we helped to create. Product Idea: An orthotic shoe insert effective in transferring weight off the heel. Inspiration: Heel Defender was born when Dr. Hanft, a foot and ankle surgeon, shattered his own heel, resulting in chronic pain and limited mobility. Sorbothane® Solution: The engineering and production team at Sorbothane, Inc. collaborated closely with Dr. Hanft and Defender Operations. The Heel Defender Orthotic is a bio-engineered design that assists in the management of a number of foot conditions. Specific geometry, and the proprietary material Sorbothane® combine to maximize shock reduction and weight transfer off the heel. Decreasing the forces and pressure on the heel when standing and moving. 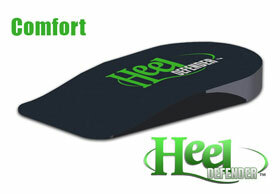 The Heel Defender can be used in conjunction with standard of care treatments for many afflictions and disorders. Product Idea: A vibration and noise-reducing component for split limb crossbows. Inspiration: As a hunter-driven company Killer Instinct® is motivated to design equipment that instills confidence and is unmatched in the field. 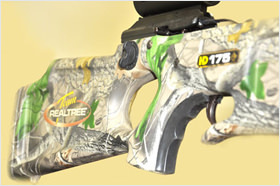 Sorbothane® Solution: Our engineering and production teams worked closely with the staff at Killer Instinct Crossbows. The objective was to produce a Sorbothane® component that would reduce vibration and help keep the award winning Killer Instinct Crossbows stealthy quiet. Thus enhancing the hunting experience. The result is a friction-fit Deadening™ Limb Silencer. 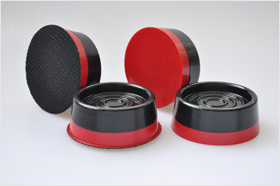 Made of Sorbothane® it is the most effective noise and vibration damper on the market. The Limb Silencer comes standard on a number of Killer Instinct Crossbows and can be purchased separately. Inspiration: While golfing, a friend introduced avid outdoorsman Willard Latimer to a piece of Sorbothane. "It sure would make a good recoil pad," Latimer said. Sorbothane® Solution: To produce the recoil-reduction pads Latimer envisioned, we perfected a multiple-layer production molding system that allowed for a rigid mounting plate to be integrated with a solid Sorbothane® recoil pad. 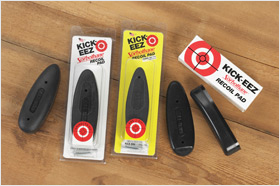 Because our material is able to absorb more impact and allow the shooter to fully recover between rounds, KICK-EEZ® Recoil Pads have been independently tested and found to reduce more recoil than any other on the market. 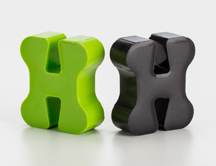 In addition, because they're made of solid Sorbothane®, they can be custom-ground for a perfect fit. As a result, KICK-EEZ® Sorbothane® Recoil Pads are available in multiple fits, and even patriotic red, white and blue colors. Inspiration: An annoying second-floor washing machine's vibration effecting tranquil living space. 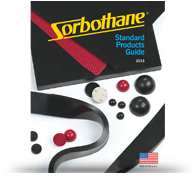 Sorbothane® Solution: We partnered with the Vibration Solution to engineer the most effective vibration-absorbing appliance pads available. Inspired by a noisy washing machine, Sorbothane® turned out to be the perfect material to isolate and reduce the annoying vibrations from that specific appliance, as well as any other in the home. Once a simple solution to a singular problem, Silent Feet have been designed to reduce or eliminate noisy and harmful vibrations on virtually every washing machine and dryer on the market today. Silent Feet are easy to install, with each set featuring two "easy-slide" rear and two "super-sticky" front feet. Product Idea: Discreet hip and tailbone protection pads for skaters. Inspiration: A personal, impact-related training injury sidelined Rachel, a young skater, from the ice for almost a year. 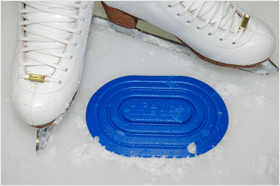 Sorbothane® Solution: The unique properties of Sorbothane® made it the ideal material for PeacePads® protective skater pads. Sorbothane® attenuates shock, moving energy laterally away from the point of impact, and stays flexible, flowing like a liquid to correspond with a skater's movements. In this specific situation, the material's wide temperature range made it the perfect application in cold conditions, as it'd never get stiff or hard. It took a year of testing materials and design before the computer-modeled PeacePads® were ready for the market, but that time allowed PeacePads® to find its way into other sports. Today, it enjoys wide usage in horseback riding, skateboarding, longboarding, motocross, mountain biking and skiing. Inspiration: An avid hunter and outdoorsman, Mike Goddard sought a consistent self-customized grip for his rifles and shotguns. Sorbothane® Solution: We helped design an innovative Sorbothane® grip to provide a custom fit for any individual's hand and shooting style. This universal grip enhances comfort and increases reliability, while the molded finger grooves allow for consistent hand placement for more accurate shots. Featuring a special 3M adhesive – God' A Grip will adhere to any wood or synthetic stock without harming the finish. With four models to choose from, there's a God' A Grip for most shotguns, rifles, crossbows and pistols. Made and field-tested by hunters – for hunters – God' A Grip retains its comfort feel in the winter cold or summer heat due to the wide temperature range of Sorbothane®. Inspiration: The idea for this product came from a need to successfully treat the pain and burning caused by plantar fasciitis, as well as stretch and begin the healing process of the affected area. Sorbothane® Solution: We worked diligently to perfect a patented design first presented by a certified athletic trainer. As a result, the Sorbothane® Swede-O Planter F3™ Foot Roller relieves heel and foot pain in three ways. First, the visco-elastic nature of Sorbothane® promotes gentle stretching and massaging of the affected area. Second, the freezer-safe roller provides cold therapy to relieve pain and inflammation. Third, due to the wide temperature range of Sorbothane®, the roller can also be used for heat therapy to increase elasticity and facilitate healing. Product Idea: A simple product to stop a tennis player's or golfer’s elbow pain at the source - the hand. Inspiration: Dr. Mark Greenberg, a sports medicine specialist, suffered from tennis elbow. While treating himself, he found he needed to target the cause of his pain, not simply cover up the symptoms. 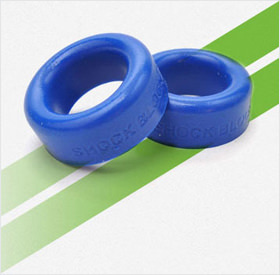 Sorbothane® Solution: Dr. Greenberg partnered with us to develop the Shock Blocker™, a comfortable Sorbothane® ring worn on the finger to absorb damaging shock created by impact in the hand. In addition to dampening shock waves causing pain in affected tendons in the forearm and elbow, the Shock Blocker™ also allows the injury to heal even while continuing activity. The Shock Blocker™ isn't limited to the tennis court, though. It can be used effectively for other equipment-gripping sports, as well as tool use. Inspiration: Simply noticing an inability to get the full performance of audio/visual equipment due to vibration interference. Sorbothane® Solution: We were tasked to design and build Sorbothane® vibration-isolation "feet" that would maximize the true performance capabilities of heavier audio/visual equipment. 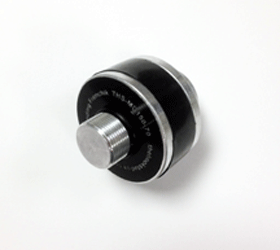 With a proprietary shape developed for maximum effectiveness, the Sorbothane® feet are used to isolate power amplifiers, receivers, power conditioners and other weighty components. These versatile feet help keep the muddying effects of vibration out of the signal chain, allowing for cleaner, purer audio and video. 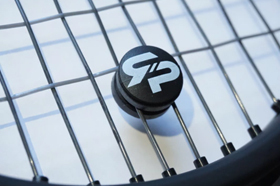 Product Idea: An effective tennis racket vibration damper that maintains a live racket feel. Inspiration: Shoulder injury and recurring pain forced tennis instructor, and former pro, Sky Kim to search for a revolutionary product to control racket vibration and shock. Sorbothane® Solution: The Sorbothane engineering and production team partnered with Sky to develop a racket damper that would reduce harmful vibration. While at the same time maintaining a distinctive satisfying “pop” when hitting a tennis ball. The design team was challenged to produce an effective damper that not only reduced “bad” vibrations but also was tear-proof and durable. Testing of the final production design of the ShockSorb shows the damper helps reduce pain and fatigue in the shoulder and arm. Blind test were held with the participants raving about the ShockSorb’s feel, sound and how much the damper helped with their arm pain. Product Idea: A protective and comfortable "sock" that would absorb harmful impact shock and could be worn during training and activity. Inspiration: Over 17 years of working with a diverse group of patients suffering with both acute and chronic pain and injuries as a result of impact strike. 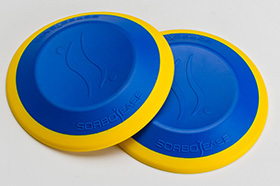 Sorbothane® Solution: After listening to the need and product idea, we partnered closely with SoleImpact’s founder, product designers and end users to engineer and produce a thin Sorbothane® pad. 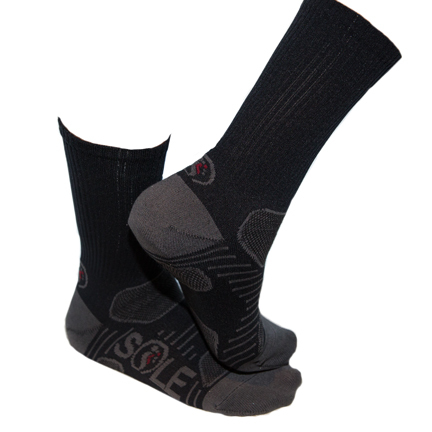 The Sorbothane® pad is designed to be stitched between layers of SoleImpact’s exclusive sock. The result is a comfortable sock that absorbs impact shock and, when worn consistently, can dramatically reduce pain and injuries related to overuse and impact, allowing the body to maximize its full potential. Product Idea: Comfort pads designed to deliver stability, cushioning and pain relief during yoga and workout routines. Inspiration: Yoga enthusiasts’ requests for a supportive and confidence building workout system that would cushion the joints and allow for ease-of-movement without pain. Sorbothane® Solution: Sorbothane® SORBO-EASE Yoga & Workout Comfort Pads provide solid support and comfort. Yellow Sorbothane® GEL provides cushion and returns energy, while Blue Sorbothane® absorbs up to 94.7% of impact stress. Flexible and lightweight, SORBO-EASE Pads support and cushion the body to absorb harmful impact and relieve stress to joints while exercising. 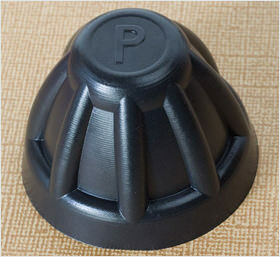 Product Idea: A vibration reducing microphone mount. Inspiration: To improve the clarity of recorded sound by reducing vibration to the microphone. Sorbothane® Solution: Our engineering team partnered with Hook Studios to design and produce the “Sorbothane®compression center member” used in the vibration reducing THS-MMD Microphone Decoupler. The Hook Studios’ Mechanical Microphone Decoupler is easy to use and universally compatible with most OEM microphone clip holders and mounts that use standard 5/8"- 27 threads. This patent pending isolation mount reduces the vibration effecting microphones resulting in more clarity of recorded sources. The Hook Studios’ MMD provides this decoupled suspension and vibration absorption regardless of the microphone's direction or angle. 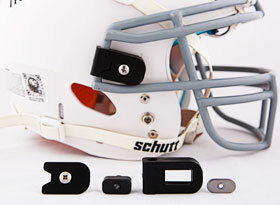 Product Idea: An impact absorbing facemask clip able to help make football safer for players. Inspiration: The realization that football helmet facemasks are underdeveloped and have the potential for impact absorbing innovation. Sorbothane® Solution: The design team from Mayfield Athletics reached out to Sorbothane when searching for the perfect shock absorbing material to use in their new S.A.F.E. Clip facemask brackets. Engineers at Sorbothane, Inc. collaborated closely with Mayfield to produce the Sorbothane® center component used in the S.A.F.E. Clip design. The S.A.F.E. Clip deforms slightly with each impact - absorbing and deflecting potentially harmful forces. Returning almost instantly to its original state the S.A.F.E. Clip is ready for the next impact. Testing has shown that the S.A.F.E. Clip is capable of reducing up to 28% of G-forces to the facemask. Mayfield Athletics’ S.A.F.E. Clip retrofits over 95% of existing football helmets.